Top 8 tips on how to use this guidebook. Photography by Harland J. Schuster 1. Plan to see every one of the 216 Wonders found in this book. This guidebook supplies photographs, background information, location, contacts, and hours for every entry to make your travel easy. 2. Use the state map fold-out to plan “cluster trips” in specific geographical regions of Kansas. This map was designed to show you all the Wonders in a certain area. Of course, you’ll find many other things to see and do beyond the 8 Wonders! 3. Enjoy Kansas one category at a time. Many members of our Kansas Explorers Club (www.explorekansas.org) have created their own “quests” (for example: visit every county seat, bowl in each county, or sip at every soda fountain). This book is organized by categories making it easy to design your own travel themes. 4. As you travel to each Wonder, get an autograph, take pictures, buy a souvenir or stamp at the local post office, and mark off your visit on the listings page (below the 8 Wonders map). 5. Have conversations with local folks, look for other interests along the way, make purchases in small towns, and go slowly to appreciate each place for what it is. Your friendliness and financial support go a long way. 6. Call for an appointment if you have a specific destination in mind. Be sure it will be open as some entries are staffed only part time by volunteers; their passion and knowledge of their subjects are priceless. 7. Plan a group tour. Call ahead and find out if you and friends, or club, can get a “backstage pass.” 8. Explore Kansas from the comfort of your armchair. Leaf through the pages of this book in your own home, at your own pace, and appreciate what Kansas and Kansans have to offer. The purpose of the contest and book is to educate the world about Kansas and to inspire travel throughout the state. For more information about each entry go to www.8wonders.org. The list below, in alphabetical order and color-coded on the map, shows the top 8 of each of the contest categories followed by the 16 finalists. Use this map as a guide to the 216 Wonders. How many can you visit? “Could you find someone to climb to the top of the water tower and pose with the red fish to show size perspective?” “Do you think you could find about 80 kids and adults to stretch across main street at 7 p.m.?” “Do you think you could find Buffalo Soldiers to pose?” “Could you find someone on horseback to meet Harland at Castle Rock?” For this book, I made 216 photo arrangements for Harland Schuster, our photographer. As often as possible Harland wanted to take shots that weren’t traditional. I kept shaking my head when he’d tell me what he wanted to do, but thanks to the tremendous cooperation from people across the state we pulled it off. The book you see today showcases these efforts. The 8 Wonders of Kansas contest started in June 2007 and ended in October 2010. More than 100,000 people voted, including those from every state in the union and many foreign countries. The contest generated well over 1,000 articles, radio and TV stories, blogs, and Facebook mentions nationwide. Unexpected results happened for those in the contest. Doniphan County graveled the road to 4-State Lookout when it became an 8 Wonder. Tony Prochaska at Trapper’s in Simpson informed us he’s been busier than ever since the contest started. Khan Nguyen from Pho Hoa said that his inclusion in the contest meant he was finally accepted into the community. Schermerhorn Park (Galena) folks reported that the contest made them feel a part of Kansas. Families and groups used the 8 Wonders entries as destinations. Teachers applied the contest to class projects. Nursing home residents voted. Communities saw themselves with new eyes. Me? I fell deeper in love with Kansas. Writing summaries for the 216 places left me in awe of who we are and what we have in this state. 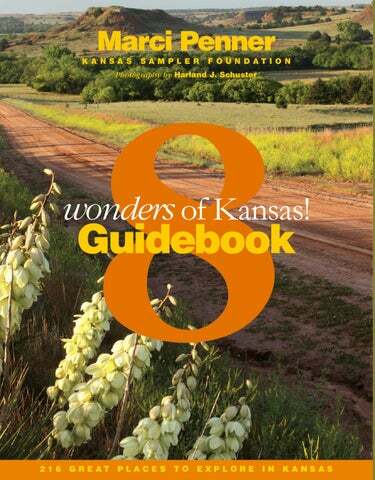 My hope is that this book helps you know Kansas better and inspires you to explore every part it. Accept each place as it is: for its beauty, its entrepreneurial spirit, or for its effort to tell a story. The eight different “Wonder” categories, the contest, and this book provide a broad view of our state. Sit back and enjoy 216 of the best places Kansas has to offer in Architecture, Art, Commerce, Cuisine, Customs, Geography, History, and People. Then, go! Visit as many as you can. If you do, you’ll understand why Kansas is a state to love. That Kansas should be so rich in art is, for many, unexpected. Not for me. I grew up in this vast slate of a state and, after some years away, chose to return to it. Kansas is steeped in the space and quiet that give people with an artistic hankering the time to stew and brew, figure and dream. Art here comes from deep within our inner workings; sometimes it moves in fits like a thunderstorm. Kansas artists speak the language of the prairie soul. If you are starting a tour of Kansas art, then I wish I could go along. What a journey to relish the sun-drenched roads to the works of our state’s acknowledged artistic greats such as oil painter Birger Sandzén and photographer Gordon Parks. Or to stand before the monuments that are Blackbear Bosin’s sculpture Keeper of the Plains and our state capitol with its John Steuart Curry murals. I hope you’ll lean in to inspect, like so many wildflowers, the lush details of St. Mary’s Catholic Church and the hide of Charlie Norton’s buffalo sculpture. Gaze up while standing inside the folk art canyon that is the Garden of Eden and before the gleaming face of Phil Epp’s sculpture Blue Sky . There is so much more Kansas art to roam —more than even I know. This arts landscape can be fresh and unexpected —maybe even shocking. And it continues to emerge from a great wellspring within our people. The Blue Sky Sculpture is one of the 8 Wonders of Kansas Art because it is a unique juxtaposition of sculptural imagery and natural sky, and because it provides the viewer with a heightened awareness of the changing Kansas sky. CONTACTS 316.283.8027; pepp@powwwer.net; www.philepp.com/ public.htm HOURS Always open. This amazing sculpture, dedicated in 2001, was the joint effort of artists Phil Epp, painter and designer; Terry Corbett, ceramist and designer; and Conrad Snider, ceramist and designer. To create Blue Sky, the drawing first was applied to brown paper with the same dimensions as the sculpture. The paper was then gridded, numbered, and cut into tile sizes. Corbett painstakingly transferred the paper patterns to the 1,600 tiles and individually glazed them. Finally, the stunning cobalt blue tiles were placed according to number on concrete. The natural sky can be viewed behind the sculpture’s gem-like surface and through the three-foot sky passageway. The fabricated blue sky and white cumulus clouds are quite dramatic in any weather condition. Snider’s large ceramic figures are intentionally abstract so that each observer can create an identity for them. In June 1937 John Steuart Curry, a native of Jefferson County, Kansas, was commissioned to paint murals in the Kansas statehouse. However, before he could finish, his work was criticized. As a result, Curry refused to sign and complete all that he had planned. Tragic Prelude, the most famous of his finished murals, is the artist’s interpretation of John Brown and the antislavery movement in Kansas Territory. Rich in symbolism, the painting depicts a fierce John Brown holding a Bible in one hand and a rifle in the other. Some accounts allege that Curry’s critics disliked his color scheme and what they considered the mural’s overall menacing effect. Some powerful politicians also objected to his proposed themes of dust storms, drought, and soil erosion for the final murals. They took steps that led to Curry refusing to finish his murals. Lumen Martin Winter was hired to work from Curry’s sketches and complete the murals, which he did in 1978. LOCATION Kansas State Capitol, 300 SW 10th, Topeka 66612 CONTACTS 785.296.3966; capitol@kshs.org; www.kshs.org/ portal_capitol HOURS Monday-Friday 8 a.m.-5 p.m.; guided tours available at the Capitol Visitor Center. For more information, see page 50. Museum of Art collection at Wichita State University, is a finalist for the 8 Wonders of Kansas Art because it has one of the most significant sculpture collections on a U.S. university campus. Personnages Oiseaux, Fernando Botero’s Woman with Umbrella, and Tom Otterness’s whimsical Millipede. 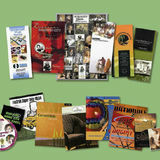 because many of them depict events and people representative of Kansas culture and history. LOCATION Stone Gallery, 107 W. 6th, Hays 67601 CONTACTS 785.625.7619. Brochures with locations of 22 Felten sculptures in Hays are available from 800.569.4505. HOURS Daily 10 a.m.-4 p.m.
Monarch of the Plains, an eight-by-ten-foot buffalo that stands on Fort Hays State University campus. Felten’s sculptures can be found throughout the Midwest, including his Four Famous Kansans, commissioned in 1981 and standing in the Kansas Capitol rotunda in Topeka. LOCATION Kansas Judicial Center, 301 SW 10th, Topeka 66612 CONTACTS 785.296.2256; info@kscourts.org; www.kscourts.org/ kansas-courts/generalinformation/photo-album/ statue.asp HOURS Monday-Friday 8 a.m.-5 p.m.
because of its purpose during the Great Depression to put Americans back to work, and because 27 original Kansas Post Office Art pieces remain today. For more about Section Art in the 21 post offices, and to find the locations of the other six existing pieces, go to www.8wonders.org. works adorned Kansas public buildings. Customs is perhaps the most elusive of the 8 Wonders because they are hidden in our daily routines. My favorite memories of a happy childhood in Hutchinson include spending hot summer afternoons lolling at the swimming pool, evenings “dragging Main” (our wide main street), and sucking on a chocolate malt at the old-fashioned soda fountain. Life was good, and these were the customs that made it good in my hometown. When I saw the 24 finalists for Kansas customs, it made me smile to realize how many thousands of people feel as I do. As we get older we revel in finding customs new to us—like chanting our university’s fight song at a big game, or listening to homespun music as we relax in lawn chairs smack dab in the middle of the street. Lindsborg enchants us with its Swedish customs, and Cawker City amuses with the quirkiness of a local farmer. Customs abound in our hobbies, daily habits, rituals, and obsessions. They can embarrass us (for example, when people halfway across the world click their heels when they learn we’re from Kansas). But most of all, customs are the simple moments that cause us to treasure life in Kansas and remind us “There’s no place like home.” We celebrate them here. BRINGING MUSICIANS TOGETHER, Cottonwood Falls Bringing musicians together, as happens every Friday night in Cottonwood Falls, is one of the 8 Wonders of Kansas Customs. LOCATION 317 Broadway, Cottonwood Falls 66845 CONTACTS 620.273.6020; prairiemaid@ sbcglobal.net; www.emmachasecafe.com HOURS Every Friday at 7:30 p.m.
offers fried catfish dinners to enjoy before listening to great music. It’s all part of the weekly fun! for the 8 Wonders of Kansas Customs. The first rail-trail, Prairie Spirit Trail, opened in 1996 and now stretches 51 miles from Ottawa to Iola. LOCATION Ottawa to Iola CONTACTS 785.448.6767; info@prairiespirittrail.org; www.prairiespirittrail.org HOURS Daylight hours outside of city limits. Trail passes required for persons 16 years and older. Built on the right-of-way of an 1860s rail line, the 8-foot-wide trail is composed of a hard-packed mixture of limestone and calcium chloride. It takes bikers or hikers through Ottawa, Princeton, Richmond, Garnett, Welda, Colony, Carlyle, and Iola, and over many bridges. Maintained by the Kansas Department of Wildlife and Parks, Prairie Spirit Trail became a state park in July 2010.
of Kansas Customs. It happens a little differently in Blue Rapids as kids cruise the only round town square in the state. PUTTING SHOES ON A TREE, Wetmore 8 WONDER FINALIST: Putting shoes on a tree is a finalist for the 8 Wonders of Kansas Customs. The ritual has made a giant cottonwood near Wetmore famous as The Shoe Tree. LOCATION 80th and V Road, Wetmore 66550. In Nemaha County, go 1 mile west of Wetmore on K-9, 5 miles north on W Road (blacktop), and 1 mile west on 80th to V Road. HOURS Always open. In the 1970s John Kissel read about a man in another rural state who had created a shoe tree. The idea stayed with Kissel, and in the 1980s he began putting shoes on a cottonwood just north of his farm. Since boyhood, Kissel watched this tree grow to its present 23-foot diameter. People are invited to nail shoes onto the tree or tie shoelaces together and throw a pair of shoes over a branch. 8 WONDER FINALIST: Racing greyhounds is a finalist for the 8 Wonders of Kansas Customs. LOCATION 407 S. Buckeye, Abilene 67410 CONTACTS 800.932.7881; info@greyhoundhallof fame.com; www.greyhoundhallof fame.com HOURS Daily 9 a.m.-5 p.m.
of Kansas Customs. The seat saving has been happening in Concordia since the 1960s. LOCATION 220 W. 5th, Concordia 66901 CONTACTS 785.243.3773; 785.614.2082; kearnauction@ yahoo.com; www.kearnauction.com HOURS Auctions held as needed, usually on a Saturday; please call ahead. In 1962 Clifford Sallman opened Sallman Auction House, and there folks gathered each week to chat, savor the homemade pie, and bid on treasures. In those days, each bid number was printed on a wooden paddle. Before long, paddles began showing up on chairs to save bidders’ favorite seats. Since that time, the auctioneers have changed, but saving seats at the auction house (now Kearn Auction House) remains a local custom. The only difference: paddles have been replaced with pillows. legendary occurrence at the world’s largest (still expanding) ball of sisal twine in Cawker City. Frank Stoeber started winding twine on his farm in 1953, and by 1961 his “symbol of thrift” had grown so large it was moved to Cawker City so all could see it. Visitors continue to add to the Ball of Twine, and as of January 1, 2011, it weighed 19,716 pounds and was 8,028,100 feet (or 1,520.47 miles) long! CONTACTS 620.276.1200; www.gcrec.com HOURS Summer, MondayThursday 1-6 p.m.; Friday-Sunday 1-7 p.m. Admission charge. the 1930s, and since that time water slides have been added. A motor boat once pulled skiers across the pool, and for a time elephants from the nearby zoo frolicked in the water after the pool closed for the season. See an exhibit about the Big Pool at the Finney County Museum, 620.272.3664.
a task made easier for students in Franklin and Arma when a sidewalk connecting the two towns was built. When the mining industry in southeast Kansas declined in the 1920s-1930s, businesses closed and schools downsized. Franklin schools closed forcing children to walk to and from nearby Arma. To assist the students, a three-footwide sidewalk was built in 1936 stretching 1.7 miles from the south edge of Arma to the south edge of Franklin. It is the world’s longest sidewalk connecting two towns. The sidewalk is listed on the National Register of Historic Places.